We love all the new after dinner treat experiences! As you might have read on our blog previously, we recently posted on the shift from just traditional wedding cakes to dessert tables and also the new, fun catering trend of adding ice cream to the dessert menu at weddings. And now, just a few weeks ago, we offered wedding guests an after dinner cheese cart before cake was served. Our wonderful bride, Alison, came to us months ago full of ideas on how to make her wedding menu really represent herself and her groom (now husband!). When we began discussing catering ideas for dessert, she said that they both really love cheese and wanted to see how we could incorporate that into the meal. 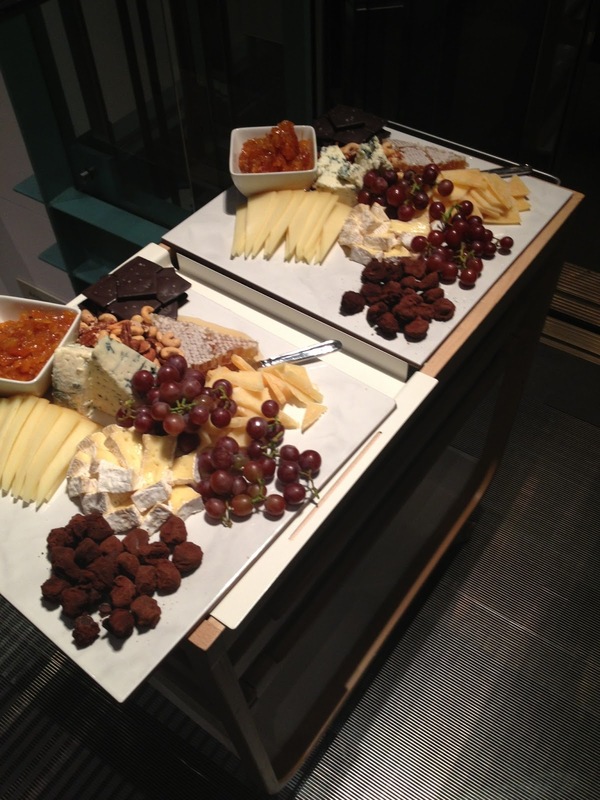 She didn’t want to just offer a display of local artisan cheeses and crackers – she wanted to make it something that wowed guests with local San Francisco chocolates, fresh honeycomb and our executive chef’s homemade compotes. The original idea was to serve small platters family-style at each table for guests to pass around, but then an idea was born. We discussed the famous “cheese cart” that is pushed around fine dining restaurants such as Gary Danko and Quince and everyone’s mouths began to water. We decided to recreate this cart at the Asian Art Museum for 154 guests. 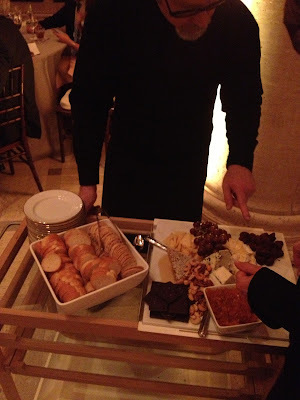 Once entrée plates were cleared, one of our favorite captains, Doug, emerged from the doors pushing the cheese cart and wheeled right up to the newly married couple sitting at their sweetheart table, garnering the attention of all guests in the room. While their eyes were peeled our staff set up a much larger cheese display with all the goodies in the back of the room. As Doug made his way through the front of the room offering guests composed plates of cheese, he casually let people know that if they just couldn’t wait, they were welcome to compose their own plates in the back. As you might imagine, many guests jumped up and started loading their plates. It was such an unexpected treat that wedding guests loved it! After about 45 minutes of cheese service the beautiful wedding cake by our pastry chef, James, was rolled out and served. Shortly after that guests were treated to Late Night Munchies consisting of truffled French Fries and mini ice cream cones (we love ice cream!) one of which was named “Ty’s Chocolate Ice Cream,” for the groom’s favorite treat. It was a night to remember filled with love, laughter and delicious cheese.